(SPEEDWAY, Ind.) January 28, 2016 – A familiar name will be part of Verizon IndyCar Series in 2016 as Ed Carpenter Racing returns to competition. Team officials announced today that the organization that operated as CFH Racing in 2015 will be known as Ed Carpenter Racing (ECR), effective immediately. The team will remain headquartered in its current location at 1255 Main Street in Speedway, Ind. Ed Carpenter, Tony George and Stuart Reed are the owners of ECR. ECR and Sarah Fisher Hartman Racing (SFHR) combined their single-car teams in August of 2014 to create CFH Racing. 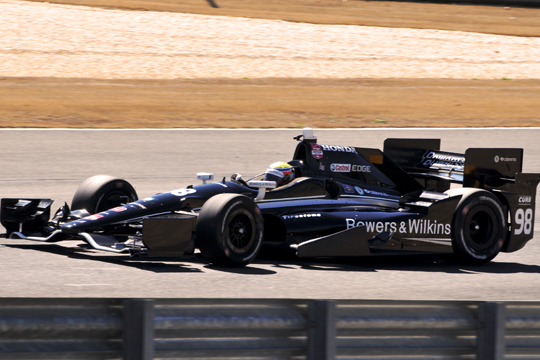 During their 2015 campaign, CFH won two races with Josef Newgarden, collected an additional three podium finishes and a earned a pole position. Moving forward, SFHR’s Wink Hartman will return his focus to his company, Wichita, Kan.-based Hartman Oil. Sarah Fisher will concentrate on her new business venture, Speedway Indoor Karting, set to open on April 1. Fisher and her husband Andy O’Gara are finalizing construction on their new 60,000-square-foot facility, also located on Main Street. Ed Carpenter Racing will return to the track at Phoenix International Raceway on February 8 for their first test of the year. The 2016 season Verizon IndyCar Series season will open on Sunday, March 13 in St. Petersburg, Fla.
An IndyCar season that seemed destined to be littered with shredded pieces and broken promises pulled itself out of the marbles just in time as the month of May looms. Josef Newgarden’s thrilling victory at Barber – his first – gives the series a much-needed boost as it ramps up for its marquee event, the Indianapolis 500. He’s American, not German or Austrian as a casual observer might have guessed. Moreover, the fourth-year driver hails from NASCAR country, specifically Hendersonville, Tennessee. Curt Cavin of the Indianapolis Star ran a nice piece about how Newgarden and his dad logged thousands of miles driving to New Castle, Indiana, to the karting track of former Indy driver Mark Dismore to begin learning his craft. Newgarden may be the first driver from the Volunteer State to ever win an IndyCar race. I sent an email to the IndyCar Series asking if this were the case, but did not get a response. Certainly no driver with a birthplace in Tennessee – or Mississippi, Alabama or Georgia, for that matter – has won the Indianapolis 500. Given how many drivers with Indiana connections who gravitated to NASCAR because they weren’t interested in Indy cars (Ryan Newman, South Bend), didn’t get a chance (Jeff Gordon, Pittsboro after leaving California) or sought greener pastures (Tony Stewart, Columbus), it’s nice to see the tables turned a bit. Newgarden drives for the newly formed CFH Racing team, an easy-to-root-for outfit. The “C” is Ed Carpenter, and the “F” is Sarah Fisher. After a rough start, Carpenter, stepson of Tony George, is a solid competitor on ovals with three victories. He’ll be aiming for an unprecedented third straight Indianapolis 500 pole this year. Fisher was one of the most popular drivers and now, despite many challenges, fields a solid and winning team. Anyway, it’s nice to watch (and talk and write about) good racing. That momentum needs to continue with the Angie’s List Grand Prix of Indianapolis on May 9 and the Indianapolis 500 on May 24. These two races, plus the doubleheader at Detroit the weekend after the 500, are the last ones on network television this year (ABC). With the rest of the races on NBC Sports Network, that means May is the last, best opportunity to grab the attention of casual viewers. CFH Racing announced that Preferred Freezer Services will be partnering with the team to field a third entry in both Verizon IndyCar Series events at the Indianapolis Motor Speedway for JR Hildebrand. Hildebrand will drive the No. 6 Preferred Freezer Services CFH Racing Chevrolet for the Angie’s List Grand Prix of Indianapolis on May 9 and the 99th Running of the Indianapolis 500 on May 24. Preferred Freezer Services offers the most modern, state-of-the-art, full service temperature-controlled warehouses in the United States. The company partnered with what was previously Ed Carpenter Racing to field a car for Hildebrand in the 2014 Indianapolis 500. With corporate headquarters in New Jersey, the company operates in 35 facilities in nine regions nationwide and has an international presence with cold storage warehouses in China and Vietnam. Hildebrand, 27, will be making his fifth Indianapolis 500 start and his first in the Angie’s List Grand Prix of Indianapolis. He was named the 2011 Indianapolis 500 Rookie of the Year after finishing second to Dan Wheldon and captured the 2009 Indy Lights Championship. In his four races at the Indianapolis Motor Speedway, Hildebrand has two Top 10 starts and two Top 10 finishes. Sausalito, Calif. native Hildebrand rounds out CFH Racing’s all-American driver line-up for the Indianapolis 500. CFH Racing’s roster also includes Josef Newgarden of Nashville, Tenn. in the No. 21 Century 21 Chevrolet and team co-owner Ed Carpenter of Indianapolis, Ind., driving the No. 20 Fuzzy’s Vodka Chevrolet. All three were part of the Fast Nine Shootout during qualifications for the Indianapolis 500 in 2014, where the nine quickest drivers of the 33-car field compete for the pole position. Carpenter ultimately earned the coveted first starting spot for the second consecutive year; Hildebrand started ninth and finished tenth, the highest-finishing position of the three CFH Racing drivers. CFH Racing’s three-car effort for the Angie’s List Grand Prix of Indianapolis includes Hildebrand, Newgarden and Luca Filippi of Italy, driver of the No. 20 on all road and street course events. On-track activity at the Indianapolis Motor Speedway will kick off on May 3 for Opening Day with the debut of the oval configuration aero kits. The Angie’s List Grand Prix of Indianapolis will take place on Saturday, May 9 at 3:30 p.m. ET. The Indianapolis 500 will follow at the end of the month at noon ET on Sunday, May 24. Both events will be broadcast live on ABC. IndyCar has announced an increase of $250,000 to its Leaders Circle program, which raises the total annual payment for eligible Verizon IndyCar Series entrants to $1.25 million. A total of 21 entrants are entered in the Leaders Circle program for the 2015 Verizon IndyCar Series season. The Leaders Circle program was established in 2002 to provide incentives to teams that participate full time in the Verizon IndyCar Series. Each Leaders Circle member is assured a minimum of $1.25 million if the entrant successfully qualifies for all of the 16 Verizon IndyCar Series events in 2015, including the 99th Running of the Indianapolis 500 Mile Race. 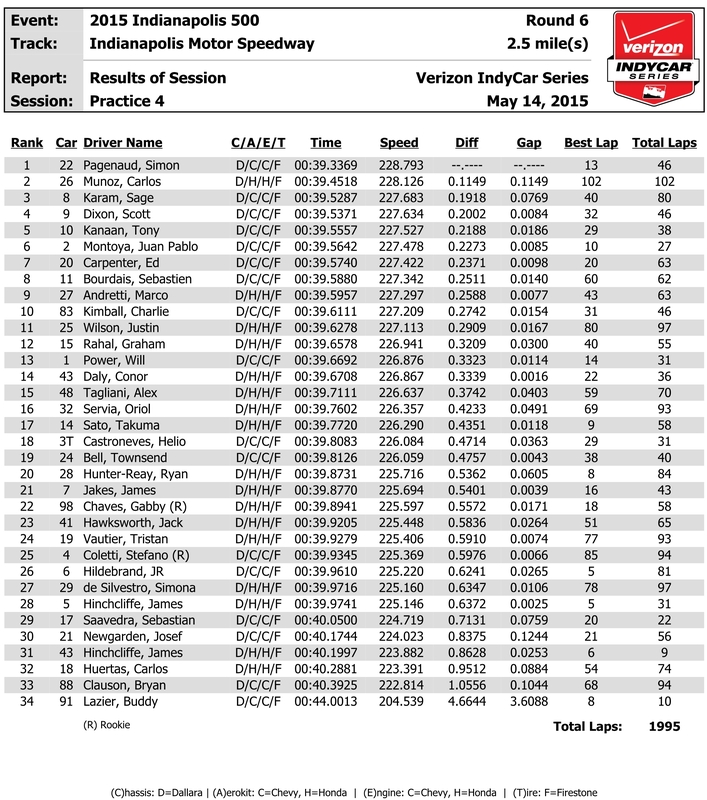 Twenty-one entrants were selected based on final 2014 Verizon IndyCar Series final entrant points. All Leaders Circle entrants will continue to compete for bonuses that will now be paid to the top-12 finishers – an increase of two positions compared to 2014 – at each Verizon IndyCar Series race aside from the Indianapolis 500. Non-Leaders Circle entrants also will compete for payouts awarded to the top-three finishers in each race excluding the Indianapolis 500. The Verizon IndyCar Series driver champion and championship entrant again will share a $1 million bonus, with second through 10th in the standings sharing bonuses totaling $320,000. The recipient of the Verizon IndyCar Series Sunoco Rookie of the Year award will receive a $50,000 bonus. Contingency awards will continue to be presented at all Verizon IndyCar Series events. See the full story. The No. 5 Action Express Racing Mustang Sampling Corvette Daytona Prototype team scored the overall victory Saturday in the 63rd Mobil 1 Twelve Hours of Sebring in the first overall victory for Chevrolet in 50 years. Joao Barbosa, Christian Fittipaldi and Sebastien Bourdais combined as the winning drivers. 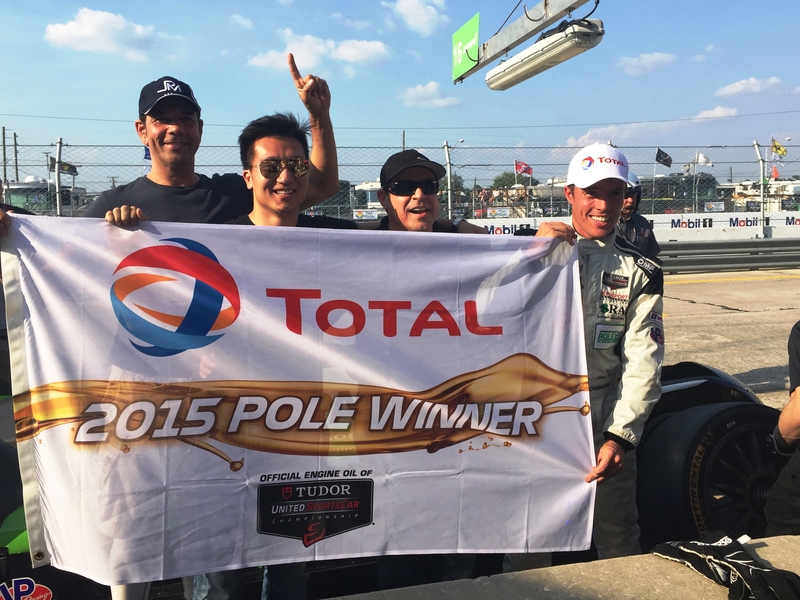 It was the fifth Prototype victory for defending champions Fittipaldi and Barbosa. Corvette Daytona Prototypes swept the podium. 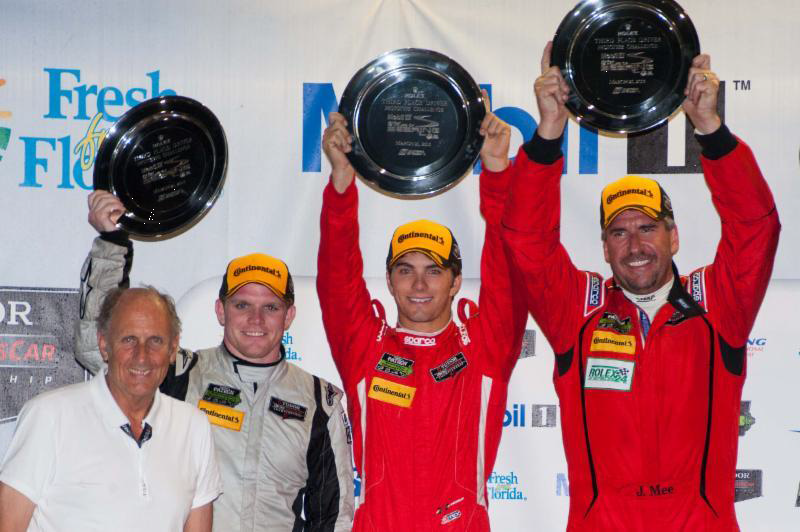 Richard Westbrook, Michael Valiante and Mike Rockenfeller took second in the No. 90 VisitFlorida,com Corvette DP, followed by Max Angelelli and brothers Ricky and Jordan Taylor in the No. 10 Konica Minolta Corvette DP. Scott Pruett, Joey Hand and Scott Dixon placed fourth in the 2014 race-winning Chip Ganassi Racing with Felix Sabates Ford EcoBoost/Riley. In the GT Le Mans class as Ryan Briscoe, Antonio Garcia and Jan Magnussen co-drove a Corvette Racing entry to its second victory this season. Martin Plowman‘s qualifying run in the #16 BAR1 Motorsports machine earned him the Total Oil Pole Award, clocking in at 1:55.257. The BAR1 Motorsports team spent much of the night rebuilding the #16 car after a crash during Thursday’s night practice. The car was immediately taken back to the paddock for repairs. Plowman tested the car in this morning’s practice session, where his time was the fastest of the morning grid. Plowman noted: “This was a massive effort by the whole team. The guys spent a lot of the night building the car. I told the engineers to give me a fast car, and I’d get the result that they wanted. They definitely delivered on that. I focused on hitting every apex, every breaking zone, and the time just appeared out of nowhere. Late addition to the speed and endurance race at Sebring was American driver Conor Daly whose debut in the event saw him behind the wheel for 6 hours and 27 minutes in the Performance Tech Motorsports No. 38 Ric Man Construction/GO PUCK ORECA FLM09 car. Daly joined Jerome Mee and James French in rounding out the Prototype Challenge class podium. — Allison Transmissions will celebrate its centennial in part by being an associate sponsor on the No. 20 CFH Racing car driven by Luca Filippi in the Angie’s List Grand Prix of Indianapolis on May 9 and by Ed Carpenter in the Indianapolis 500 Mile Race on May 24. Allison traces its corporate lineage to the founding of the Indianapolis Speedway Team Co. on Sept. 14, 1915. As a co-founder of Indianapolis Motor Speedway and part-owner of several racing teams, James A. Allison established a precision machine shop and experimental firm on Main Street in Speedway called the Allison Experimental Co. to support his racing endeavors. As a race team owner, Allison won the 1919 Indianapolis with driver Howdy Wilcox. Gabby Chaves, the 2014 Indy Lights Presented by Cooper Tires champion, will drive the No. 98 Honda in the 16-race season. Click here to read more about the partnership.